How fast could I get out of debt? How much can you save in interest payments? That is what our Debt Reduction Calculator can help you figure out. Getting out of debt is not easy, but with a good plan and firm determination, it is entirely possible. 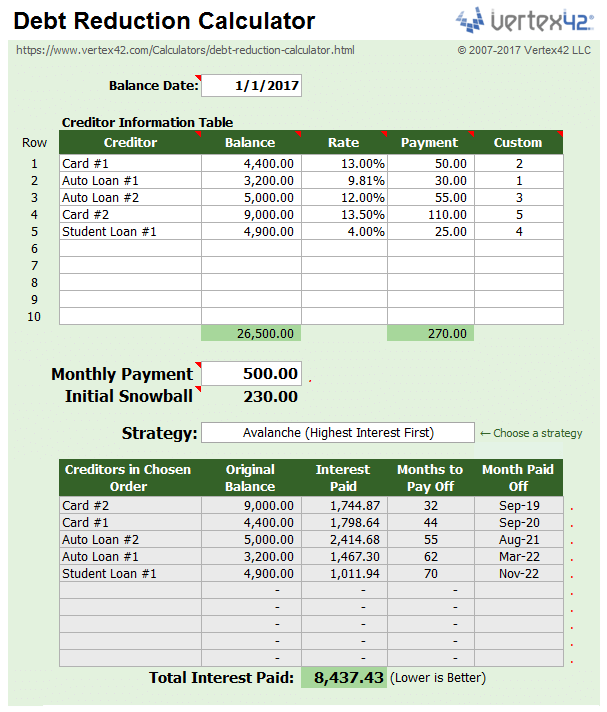 The debt snowball calculator is a simple spreadsheet available for Microsoft Excel®, OpenOffice, and Google Sheets, that helps you come up with a plan. It creates a debt snowball payment schedule that can help you manage your payments to most effectively pay off your debts. Learn how you can save $100's or even $1,000's of dollars. 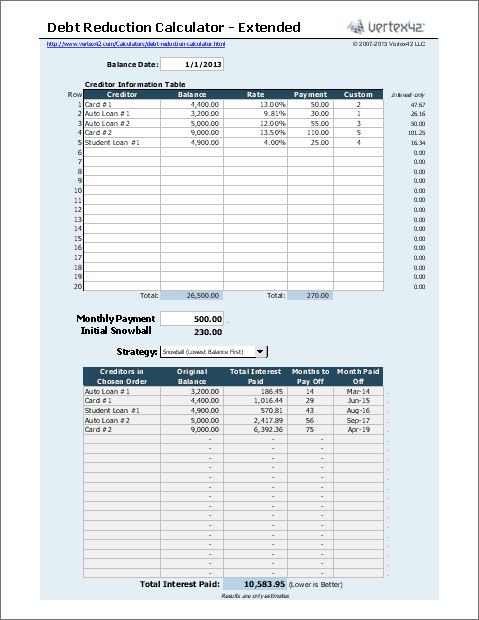 One of the most powerful things about this spreadsheet is the ability to choose different debt reduction strategies, including the debt snowball effect (paying the lowest balance first) or the debt avalanche (highest-interest first). Just choose the strategy from a dropdown box after you enter your creditor information into the worksheet. The first step in a debt snowball plan is to make a budget, then stick to it. The more you can squeeze out of your budget to increase your debt snowball, the faster you'll reach your goals. Continue reading below the download block for links to useful blog articles and information about the various debt reduction strategies. Include up to 10 creditors. Purchase the extended or pro version to list up to 20 or 40! Need to list more than 10 creditors? Get the new Extended version that lets you list up to 40 creditors. For the price of a good lunch, you can figure out how to save yourself hundreds or thousands of dollars! Note: The download includes an extended version of the credit repair edition for listing 20 creditors, and a link to a Google Sheets version for listing up to 20 as well. Use our debt snowball calculator to help you eliminate your credit card, auto, student loan, and other debts. Easily create a debt reduction schedule based on the popular debt snowball strategy, or experiment with your own custom strategy. 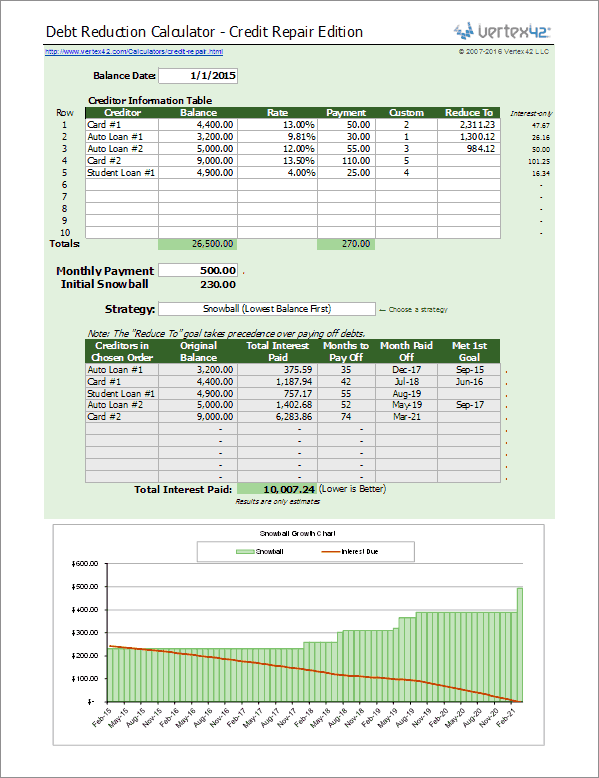 In the first worksheet, you enter your creditor information and your total monthly payment. You'll then see a summary of when each of the debts will be paid off based on the strategy you choose. 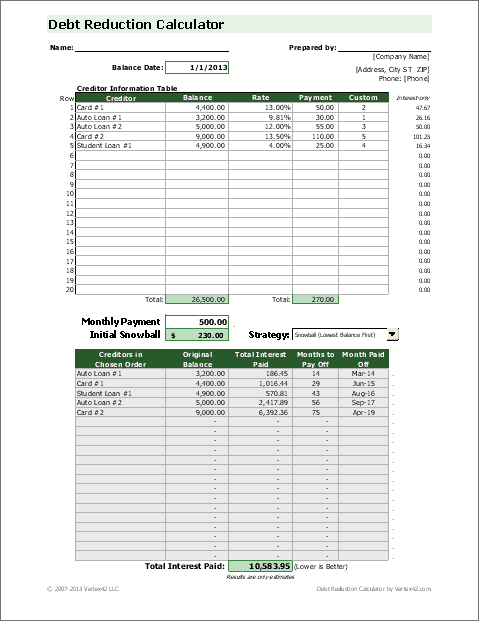 The second worksheet is a payment schedule for you to print to keep track of your progress. You can also see how the snowball increases as you pay off your debts. 3/17/09 Update (version 1.2) - Now includes a Snowball Growth Chart so you can see how the snowball increases and your interest due decreases over time (only in the Excel versions). 1/29/10 Check out our new Credit Repair edition of this calculator. - List up to 20 or even 40 creditors! - Use the calculator in your business to help advise clients! 2. The Commercial Use License allows you to use the spreadsheet in your business. - Unlike the free version, which is allowed only for personal use, you can use the pro version to help clients that you are advising. - The templates includes a section at the top to list your client's name and the preparer's name and address (see the screenshot). - Bonus Spreadsheet: The pro version includes a commercial license of the Credit Repair edition. Enter abbreviated names for your the credit card or lending institution, the current balances, and the interest rate information for all of your current debts (including home equity lines of credit or second mortgages). Enter the minimum payment you will make each month for each debt. You may need to verify with your lending institutions what your current minimum payments are. Also, keep in mind that your minimum payment may change over time, depending on interest rates or other issues. Choose the maximum monthly payment that you can pay each month towards your debts, based on your home budget. The difference between the total minimum payments and your total monthly payment is your initial snowball. This initial snowball, or "extra payment", will be applied to the first debt, depending on your chosen strategy. When your first debt is completely paid, the remainder of your snowball is then applied to the NEXT debt, and so on, until all the debts are paid. Warning: It may be tempting to put your full financial strength into paying off your debts. But, be careful. You need to balance your debt reduction goals with the need for an emergency fund and other important financial goals. In these cases, it really CAN be useful to seek the advice of a qualified professional. This section describes the different strategies that you can choose within the debt snowball spreadsheet. You may also want to see our Credit Card Payoff Calculator for more information. Unless you choose the "No Snowball" option, ALL of these strategies make use of the snowball "effect" where after you pay off your first debt you roll that payment into helping pay off the next one. For more information, see Dave Ramsey's article on the debt snowball effect, or read his book, "The Total Money Makeover". Debt Avalanche (Highest Interest First): This strategy results in the lowest total interest, but depending on the balance of your higher interest loans, it may take you longer to see your first loan/debt completely paid off. If the difference in the total interest is not significant, than you may get more satisfaction and success from the Lowest Balance First method. No Snowball: Select this option if you want to see how long it will take to pay off the debts based solely on the individual payments you specify (i.e. no snowball effect). In some cases, you may find it will take more than 30 years to pay off some debts. User-Specified Order: There are three options for choosing the order that you want to pay your debts. You can choose "Order Entered in Table", which is self-explanatory. You can also use the Custom column to enter your own formulas or your own ranking and choose "Custom-Highest First" or "Custom-Lowest First". I'd suggest ranking each row using values "10, 20, 30, 40, etc." . The reason to enter the order by 10's or 100's is so that you can easily switch the order. For example, you can move the one marked "30" ahead of "20" by changing the 30 to 19. You can also use the built-in SORT command via the Data menu. Debt Snowflaking: This is a term for making extra debt payments above the normal monthly payment (above and beyond the normal snowball). You can add "snowflakes" for any given month, using the "Additional" column in the PaymentSchedule worksheet. See the article What is a Debt Snowflake? to see how to add snowflakes to the debt snowball calculator. If you choose the "Lowest Balance First" method, and two of your balances are roughly the same amount, but have very different rates, you might want to switch the order that you pay them off so that you pay the higher rate first. It might not make much difference in how long it takes to pay them off, but it could make a difference in how much interest you end up paying. To use this approach in the worksheet, you'll need to choose the "User-Specified Order" methods described above. 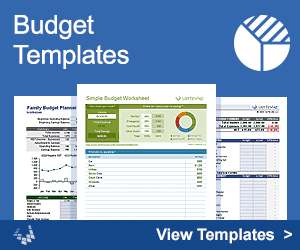 You Need a Budget - Read our review of the #1 budgeting tool. Debt Snowball - The Truth About How to Get Out of Debt at daveramsey.com - A must-read article. Choosing and Using Credit Cards at www.ftc.gov. Free Secure Online Debt Reduction Calculator at www.PowerPay.org - I used this to compare with the spreadsheet. It allows a few more options for minimum payments. Use the Snowball Calculator to Pay Off Debts - at LifeHacker.com - Many comments from people who have used the technique. Sample Letter to Student Loan Servicer - at consumerfinance.gov, Oct 16, 2013 - This article includes a sample letter for explaining to your loan servicer how you want your extra payments to be applied. Help us help others break free from the bonds of debt by spreading the news about this free debt reduction tool. Link to this page on your website, in your blog, via Facebook, etc. Have a Success Story? We would love to hear it. A big thanks to Donald Wempe for motivating me to create the original version of this spreadsheet, and for his great suggestions and feedback! And a big thanks to the many others who have offered suggestions and feedback since then.